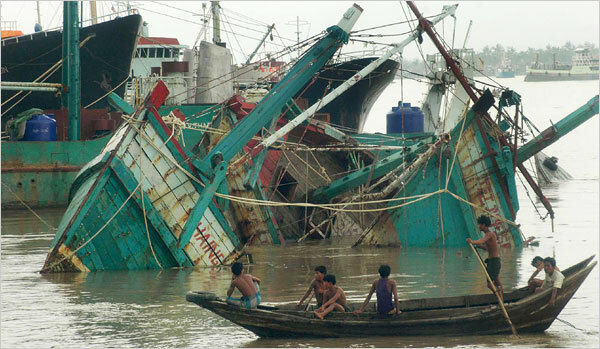 Cyclone Nargis was one of the deadliest and most destructive tropical cyclones to ever hit Myanmar (formerly Burma). The cyclone was responsible for unprecedented loss of life and destruction. It was particularly devastating in the low-lying and densely populated Ayeyarwady (Irrawaddy) River delta region of Myanmar. April 28, 2008: As of April 28 the storm system named Nargis remained almost stationary in the Bay of Bengal, at about 1210 km off Cox’s Bazar coast, 1280 km away from Chittagong, 1200 km away from Mongla, and about 550 kms east of Chennai, India. As of 21:00 PM UTC the storm was centered near 13.0N, 85.5E. April 29, 2008: As early as April 29, 2008 Nargis was classified as a severe tropical depression that was quickly turning into a cyclonic storm system with the potential to strike either Bangladesh or Myanmar within four or five days. At the time Nargis was over 1,100km away from the Bangladesh coast. The wind speed within 54 kilometers of the storm center was about 62 kmph, with gusts expected to rise up to 88 kmph. Nargis was closely watched, as it was the first cyclonic storm in the Bay of Bengal since Cyclone Sidr had struck Bangladesh in November of 2007 with wind speeds of 210kmph. Sidr had killed more than 3,000 people and had also caused damage to huge assets and crops. Since there is a tendency for most storm systems to move in a northerly direction in the Bay of Bengal, there was concern that Nargis could intensify further and move in a northerly direction towards Bangladesh or the Indian coast. There was also concern that Nargis could change direction, move in a northeast direction and possibly hit the Myanmar coast. 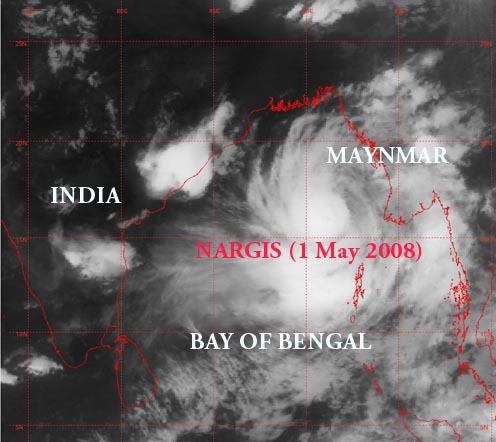 April 30, 2008 - By April 30th, Nargis remained practically stationary in the west central and adjoining east of the central Bay of Bengal, laying near 15.0N 87.5E, or 850 kms west-southwest of Sandoway (Myanmar), but moving north very slowly. At 18:00 PM UTC, Nargis was labeled as a Very Severe Cyclonic Storm Nargis (980 hPa). Gathering strength, its minimum sustained wind speed ranged between 90kmph and 120kmph within the 54km radius of its center. Maximum 3 minute sustained winds near the center were 65 knots with an estimated central pressure of 980 hPa. Satellite imagery showed broken to solid intense to very intense convective clouds between 13.5N to 19.0N and 85.5E to 89.5E in association with the system. It was still unknown where it was going to make landfall. Already, the Met Office in Dhaka had declared Nargis as a severe cyclonic storm since its wind speed had exceeded 89kmph. There were expectations that the wind speed could exceed 120kmph, in which case the storm would have been categorized as “very severe”. However, such winds speeds had not reached that level yet. May 1, 2008: Nargis was still almost stationary on the West Central Bay of Bengal but intensified further while moving very slowly towards the North Eastern Bay of Bengal. At the time, the eye of the storm system was about 1,000 kilometers (km) southwest of Chittagong port, 935km southwest of Cox’s Bazar port, and 875km south-southwest of Mongla port. May 2, 2008: A special bulletin of the Met Office in Dhaka, stated that the eye of the tropical storm was about 1,000 kilometers (km) southwest of Chittagong port, 935km southwest of Cox’s Bazar port, and 875km south-southwest of Mongla port, with a minimum wind speed between 90 and 120 kilometers per hour (kmph), within a 54km radius of its center. 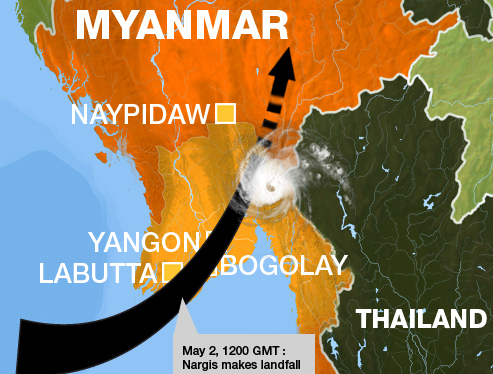 By the evening hours of May 2nd, Nargis changed its course eastward and started to cross the Myanmar coast. At this time the storm system was centered about 210km west of Haing Gyi Island at the mouth of the Irrawaddy River and about 430km southwest of Yangon. Haing Gyi Island begun being inundated by a storm surge that reached 3 to 3.5 meter (10-12 feet). Nargis gained further strength and begun exhibiting erratic behavior as it started to cross the Irawaddy river delta coast at about 6:00pm (local time) on Friday, May 2. When it made direct landfall on Maynmar, Nargis was an upper category 3, bordering on category 4, storm system with winds of 130 -135 mph. Throughout Friday night (May 2) and Saturday morning (May 3) it continued battering the Irrawaddy delta with winds of up to 150 mile (240 km/h) an hour and during that time interval it dumped 20 inches of rain. Traveling over land the winds eventually diminished in strength. When it struck the capital city of Rangoon (Yangon), Nargis had diminished to a Category 1 storm, with maximum winds of 80 mph. At 5:30am local time on Saturday, May 3, the winds at the Yangon airport were clocked at 69 mph, but with gusts of up to 138 mph., at which time the measuring anemometer there failed. More than likely, greater gusts were experienced in the airport area and elsewhere near Rangoon. Maximum reported flooding by the cyclone’s surge was at least 4 meters (13 feet), but probably greater in certain areas of the Irrawaddy Delta region. The destructiveness of the surge resulted form Nargis’ azimuthal direction of approach from the east to the southern tip of the peninsula fronting the delta region - which resulted in maximum winds having a counterclockwise circulation in the shallow offshore continental shelf area. 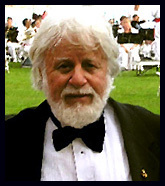 These counterclockwise winds and the coastal geomorphology of the region contributed to a water pile-up effect and the resulting high storm surge into the bay that flooded the coastal and low-lying inland areas. Had Nargis made landfall further north or made a crossing further south of this region, the surge and the destruction would have been much less. Also, the change in the azimuthal path near the river delta region from near east to a northeast direction contributed to the water pile up effect and the resulting high surge. The cities of Yangon, Irrawaddy, Pegu and the states of Karen and Mon Worse were the most severely affected regions of Myanmar. There was extensive flooding and destruction of boats, homes and structures. All utilities were down. The destruction was particularly extensive because most structures in this region are poorly built. 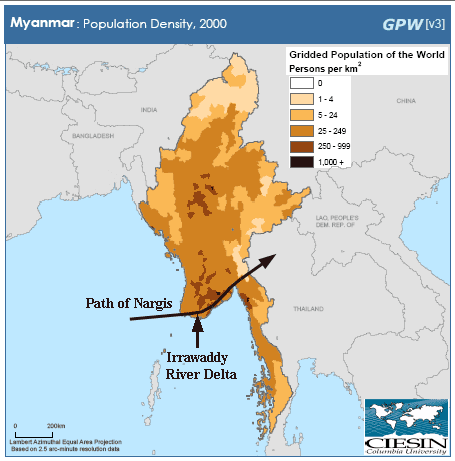 Worse hit was the densely populated Irrawaddy River delta region. This is a low-lying coastal region, which is highly vulnerable to storm surges. Reportedly, entire villages disappeared. Most of the deaths resulted from drowning due to the high storm surge. As of Tuesday May 6, 2008, the total death toll in Myanmar was greater than 20,000, with thousands more people missing. At least 10,000 people were killed in the township of Bogalay alone. As of May 12, 2008 the death toll reported by the Maynmar government was 22,400 but the actual death toll was estimated to more than 100,000. Cyclone Nargis is the deadliest natural disaster to hit Myanmar in recent history. Two NASA satellite photos show the devastating effect of Cyclone Nargis over the Irrawaddy delta region of Myanmar. The image on the left taken in April 15, 2008 shows the Irrawaddy River flowing south and splitting into numerous tributaries. Rivers and lakes are sharply defined against a backdrop of vegetation and agricultural land. 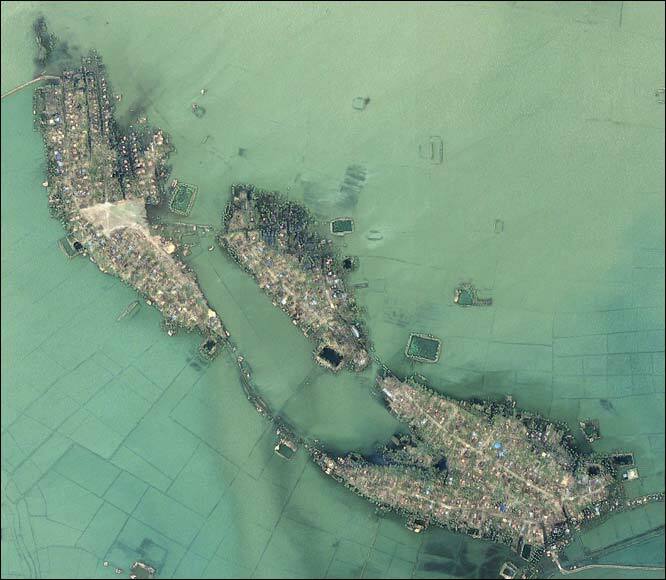 The image on the right was taken on May 5, 2008 and shows the entire coastal plain being flooded after Cyclone Nargis direct hit. The city of Yangon (located by the red rectangle) was almost completely surrounded by floods. Flooding by Cyclone Nargis surge at the Irrawaddy Delta. Non-flooded land of higher elevation seen as islands from NASA satellite. 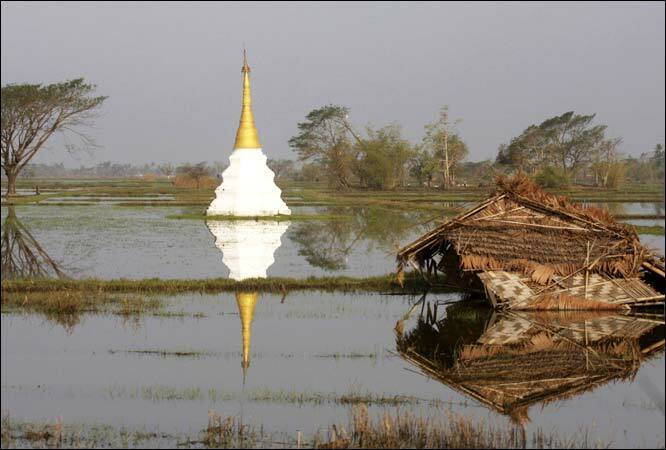 Although not frequently, cyclones and their surges have struck Myanmar in the past. However, none of the past historic cyclones was as severe as Nargis in terms of destruction. 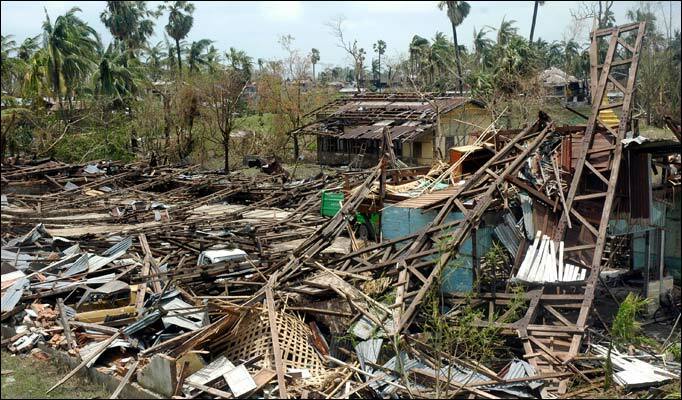 The most recent event was the powerful Cyclone Mala which, on April 28, 2006, swept ashore over Myanmar with winds near 210 kilometers per hour (130 miles per hour). The storm inundated the country with heavy rain and left widespread flooding in its wake. According to the Myanmar state media, one person died and 21 others were injured by this storm. Another recent event, Cyclone Gwa of May 4, 1982, was a Category 4 storm system with winds up to 140 mph winds. However, Gwa made landfall on an area further north of Nargis. Although, Gwa’s surge was as high - at about 4 meters - it was confined and had a far lesser destructive impact. Gwa’s winds were unable to pile up as much volume of water along the southern shore of the Irrawaddy River Delta. Reportedly only five people lost their lives to Gwa – although a higher number is suspected. Another tropical cyclone that struck Myanmar on May 7, 1975 was a Category 1 storm system. No details are available, but according to sketchy reports, 187 people were killed. According to a United Nations database, another windstorm (probably a cyclone) killed about 2,700 people in 1926. As early as April 29, 2008 Nargis had beenreadily identified as a tropical depression that was turning into a dangerous cyclonic storm system, having the potential to strike either Bangladesh or Myanmar within four or five days. Although Nargis was still over 1,100km away from the Bangladesh coast, precautions were taken in that country and shelters were activated. However, no similar precautions or warnings were reported from Myanmar.